MOST PEOPLE THINK RED first when they think of apples. 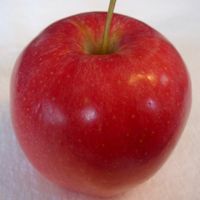 This takes in a multitude of varieties, after all, like the aptly named IdaRed or Eastern Red Delicious, to name two, across a spectrum of colors from pink to burgundy to crimson. Then come the green apples (such as Rhode Island Greening, Shamrock, Granny Smith), and dozens of varieties that combine the two (famously the McIntosh, Cortland, and Macoun). There are the yellows (Golden Delicious, Crispin, Silken) and browns (all of the russeted apples). There is even a dark-skinned Blue Pearmain and a Black Oxford. Various combinations of these many hues create a kaleidoscope of apple colors. But when it comes to apples, most people don’t think of orange. Yet this shade often characterizes one of the world’s most popular apple varieties, Gala. 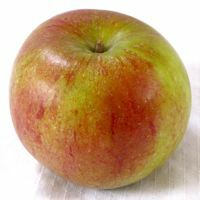 Then there is Cox’s Orange Pippin, England’s most famous apple. Two heirloom varieties also originating in the United Kingdom, Ashmead’s Kernel and Ribston Pippin, are similarly distinguished by their unusual orange cast. Some describe Ashmead’s Kernel’s appearance as “dull,” with which we take issue. We consider Ashmead’s Kernel to be a rather stunning apple for the distinctly orange tones that shine through its russeting. 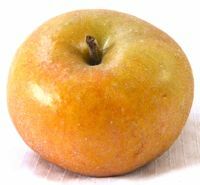 Disagreement over Ashmead’s Kernel appearance is nothing, however, compared to the wildly varying attempts to describe its flavor. Ashmead’s Kernel has been said to taste like pear drops, nutmeg, or lemon, and smelling like tea! “Its initial Madeira-like mellowness of flavor overlies a deeper honeyed nuttiness, crisply sweet not sugar sweet,” wrote the late food writer Philip Morton Shand about Ashmead’s Kernel. “Surely no apple of greater distinction or more perfect balance can ever have been raised anywhere on earth.” (Shand, incidentally, was the grandfather of Camilla Parker Bowles, wife of Prince Charles). Not surprisingly, an apple this delicious but hard to characterize is also versatile, good for eating fresh, in salads and cooking, and it is also prized for juice and hard cider. It tends to sweeten after it is picked, usually in late September and October. A doctor in Gloucester, England in the 1700s, generally is credited with its discovery, from a chance seedling. Ribston Pippin is orange-brown in color, ripening to crimson and gold. Like Ashmead’s Kernel, it has a strong flavor that continues to develop after harvest, and has been compared to pears. Ribston Pippin was first grown in 1707 in the United Kingdom and was popular in the 1800s, when it was first shipped to America. Today, Ribston Pippin is grown in fewer orchards than its more famous offspring, Cox’s Orange Pippin, but it is worth the search for its elegant appearance and flavor. It is a mid-season apple, ripening in September, and does not store particularly well. Cox’s Orange Pippin, as its name implies, is predominantly orange-red hue in color, with red-striping. It spicy, aromatic flavor make it an excellent choice for cider as well as fresh eating. Cox’s Orange Pippin was developed in the United Kingdom as a chance seedling around 1825. It ripens in late September to early October. These three orange apples from England are dwarfed today by Gala, one of the most widely grown apples in the world. Gala is a red-orange apple with yellow striping, crunchy and juicy, with a sweet, pear-like flavor. Gala apples are outstanding for snacking, salads, and baking, and are ready for picking in September. While orange is present in nearly all Galas, they tend to have a yellowish cast early in the season and become a darker red-orange as the season progresses. 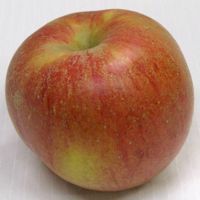 Developed in New Zealand and introduced in 1934, Gala derives its genetic heritage from Cox’s Orange Pippin, Kidd’s Orange Red, and both Red and Golden Delicious. Among its offspring is Jazz. THIS HAS BEEN A GOOD YEAR FOR GALAS in New England, and we have been featuring them in our booth in the Massachusetts Building at the Eastern States Exposition in West Springfield, Massachusetts, from Cold Spring Orchard in Belchertown, Nestrovich Fruit Farm in Granville, and Tougas Family Farm in Northborough. 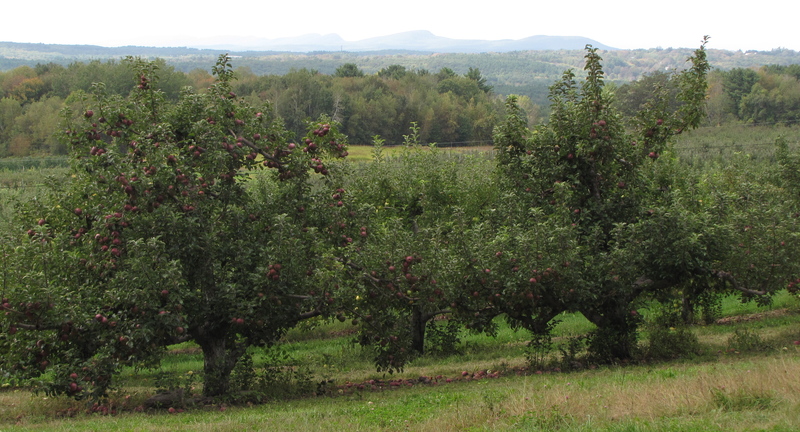 While Galas are grown around the globe, nothing compares to their flavor straight from the tree at a New England orchard. This weekend’s forecast — sunny, in the 60s — is ideal for apple-picking, whether for Galas, or heirlooms like Ashmead’s Kernel. Visit our New England Apples website and choose the link Find An Apple to see where unusual varieties can be found, and call ahead to your orchard to see what’s picking. If you are going to the Big E, which ends Sunday, be sure to visit our booth and sample some cider from Carlson Orchards in Harvard, and Atkins Farm cider donuts, made fresh every morning in Amherst. Or try some apple crisp and apple pies made by Marge Cook at Cook’s Farm in Brimfield, in addition to fresh apples from Red Apple Farm in Phillipston and Brookfield Orchards in North Brookfield. We’ll also have supplies of our new 2012 New England Apples calendar for sale, recipe cards, and our brochure/poster. We’d love to talk apples! CONTINUING THE ORANGE THEME, here is one of the recipes we’re handing out at the Big E, combining apples with another orange star of the season. It came to us from The Big Apple in Wrentham. Preheat oven to 400º. Clean out squash and place in large baking dish filled with 1/2-inch water. Combine apples, nuts, maple syrup, and butter. Fill cavity of squash with this mixture. Cover with foil and bake 45 minutes.